Paterson, W.S.B. et al. "Ice Cap". The Canadian Encyclopedia, 10 May 2016, Historica Canada. https://www.thecanadianencyclopedia.ca/en/article/ice-cap. Accessed 20 April 2019. Steacie Ice Cap, Axel Heiberg Island, Nunavut. St. Elias Icefield, Yukon. Bedrock mountains, called nunataks, appear from beneath the ice. 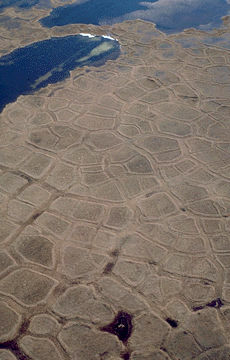 Ice caps are large masses of ice that rest on land and cover most of the underlying landscape. If bedrock appears in the central region of a large ice mass, then the region is instead called an icefield. When an ice cap is greater than 50,000 km2 in size, it’s called an ice sheet. In Canada, the largest ice caps are found in the Arctic Archipelago; the Agassiz Ice Cap on Ellesmere Island is an example. Ice caps are increasingly affected by climate change, as warmer temperatures are causing them to shrink at historically fast rates. Ice caps are typically thickest at their centre, and flow outwards from a central dome. As ice moves away from the central dome it erodes the underlying bedrock, and over many thousands of years will form a valley. Ice near the edges of an ice cap can become constrained in these bedrock valleys, forming a type of glacier called an outlet glacier. A series of outlet glaciers drain ice from the centre of the ice cap, as they typically move at a higher rate than the ice cap interior. 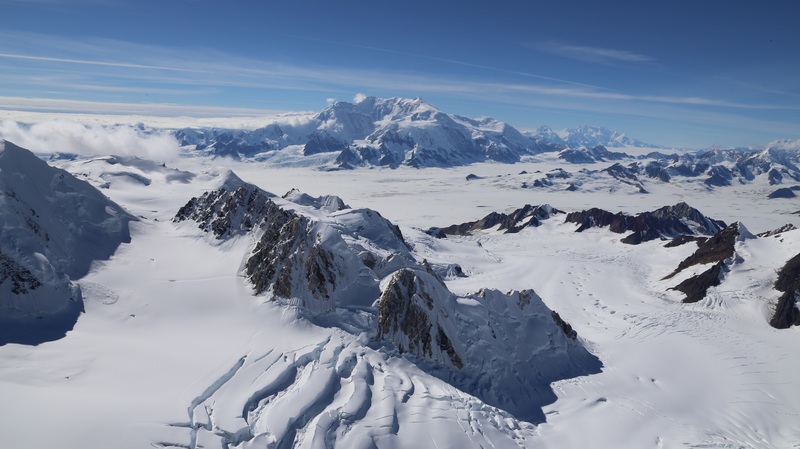 If the summit region of an ice cap does not cover the underlying land, bedrock hills or mountains (called nunataks) will appear from beneath. In these cases the ice cap is referred to as an icefield. 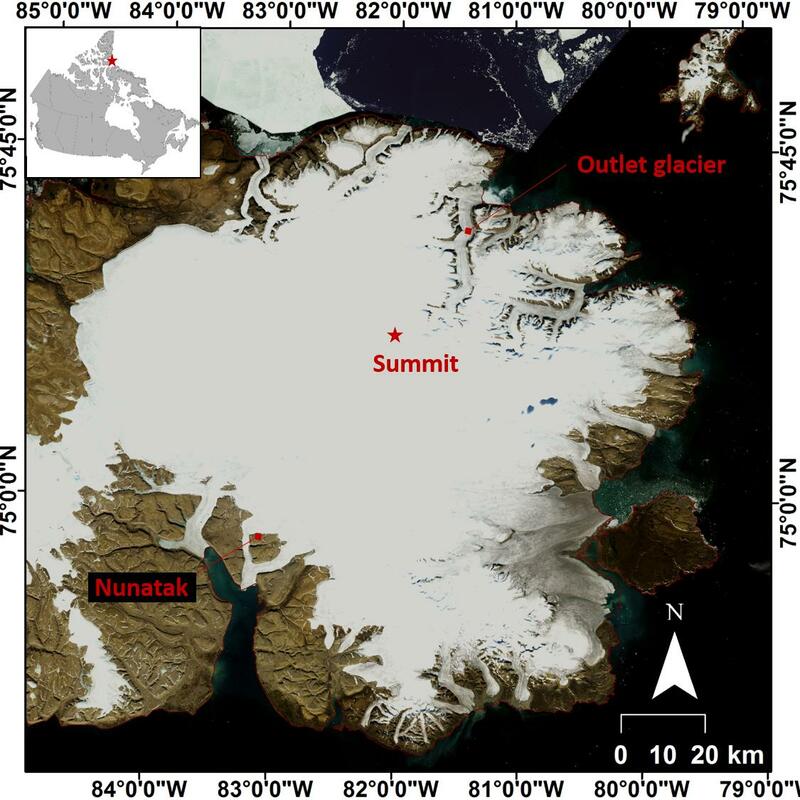 The Devon Ice Cap is located on Devon Island, Nunavut. This image shows the rate at which glaciers flow away from the centre of the Devon Ice Cap. Dark blue indicates a rate of 0 to 20 m per year, while deep red indicates a rate of motion up to 350 m per year. 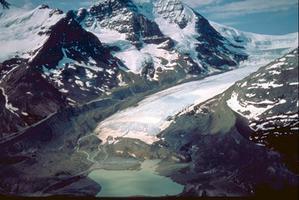 Ice caps, icefields and glaciers impact the annual water cycle in many mountainous regions, such as the Canadian Rockies. They act as a sponge to store precipitation in the winter when it falls as snow, and then gradually release it in the summer as the snow and ice melts. This provides an important source of water for ecosystems and crop irrigation in downstream areas such as Alberta and Saskatchewan at the warmest time of year, when there often isn’t enough local precipitation to meet demands. In simple terms, an ice cap forms when a region receives more snow in a year than it loses. The top of an ice cap, where most of the year’s snowfall collects, is called an accumulation zone. In this region, old snow layers become buried by subsequent snowfalls, causing them to increase in density and, after about a year, form firn — coarse, granular snow. 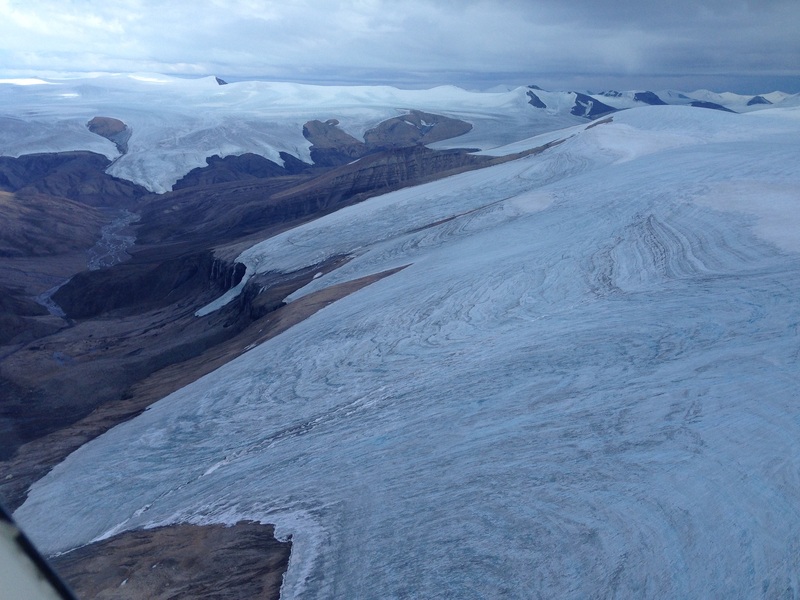 This firn is then transformed into glacier ice as it gets further buried, at a depth of around 40 m.
The lower elevations on an ice cap are referred to as the ablation zone, where more ice is lost each year than snow accumulates. Most of this ice loss occurs due to melting, but in some cases ice is also lost when icebergs calve, or break away, into an ocean or lake. Ice flow from the accumulation zone provides the main source of ice for the ablation zone. The largest ice caps and icefields in Canada are found in the Canadian Arctic Archipelago, covering a total area of more than 100,000 km2. 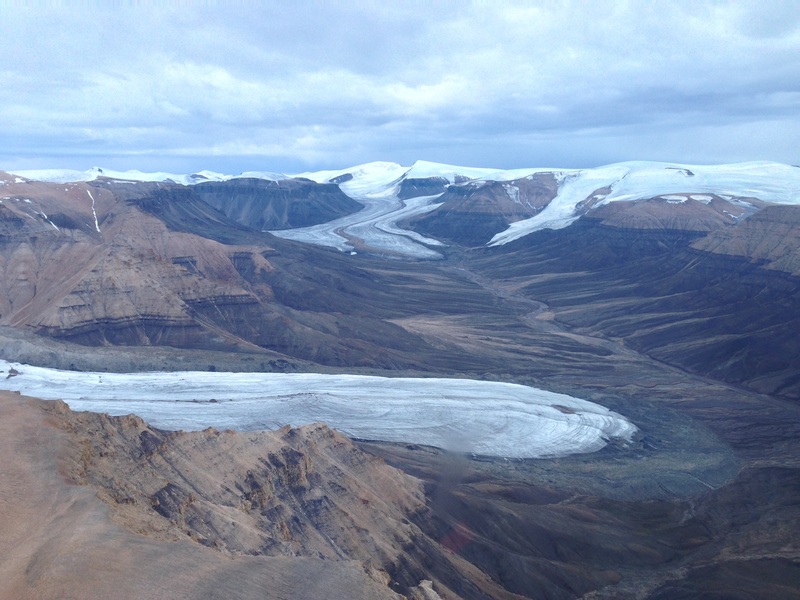 For example, Ellesmere Island contains the Agassiz Ice Cap, Prince of Wales Icefield and Northern Ellesmere Icefield, all of which exceed 19,000 km2 in area. Other large ice caps and icefields are found on Axel Heiberg, Devon and Baffin islands. The ice in some of these caps and icefields is up to 1 km thick and over 100,000 years old. In the Canadian Arctic, many ice caps have an asymmetric form. On their ocean-facing sides there is relatively high snowfall that results in high ice accumulation rates and therefore faster ice motion. This results in fast-flowing outlet glaciers (moving up to 1 km per year) that are cut deeply into the bedrock and often terminate in the ocean. In regions that face away from the ocean, there is typically less snow, resulting in more slowly moving outlet glaciers (tens of metres per year), which often terminate in broad lobes on land. Mountain ranges in western Canada contain many icefields. 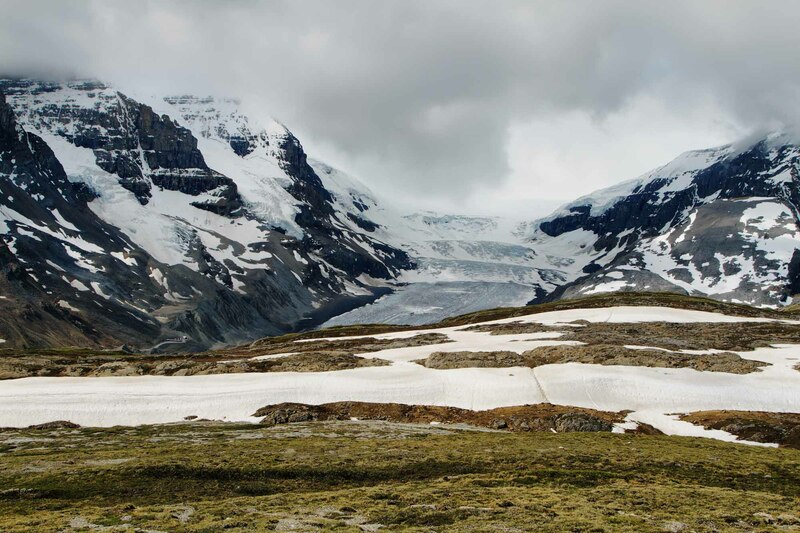 Perhaps the best known is the Columbia Icefield, a major tourist attraction adjacent to the Banff-Jasper highway. It is the largest ice mass in the Rocky Mountains, with an area of 230 km2, and is drained by several outlet glaciers, including the Athabasca and Saskatchewan glaciers. The icefield reaches a thickness of at least 365 m in its upper parts, although the thickness of the outlet glaciers is typically no more than 100–150 m. About 4 m of ice is melted from the surface of the lower part of the Athabasca Glacier each summer, which is more than the amount being replaced by ice flow from above. This has resulted in the long-term retreat of the glacier; it has lost approximately half its volume and has shrunk by more than 1.5 km over the past 125 years. If ice caps are greater than 50,000 km2 in size, they are referred to as ice sheets. Today there are just two of them: the Greenland and Antarctic ice sheets. During the last major glaciation, which peaked approximately 20,000 years ago, large ice sheets covered much of eastern Canada (Laurentide Ice Sheet), western Canada (Cordilleran Ice Sheet) and northern Europe (Eurasian Ice Sheet). Today, the Antarctic Ice Sheet has an area of almost 14 million km2 and a maximum thickness of about 4.8 km. 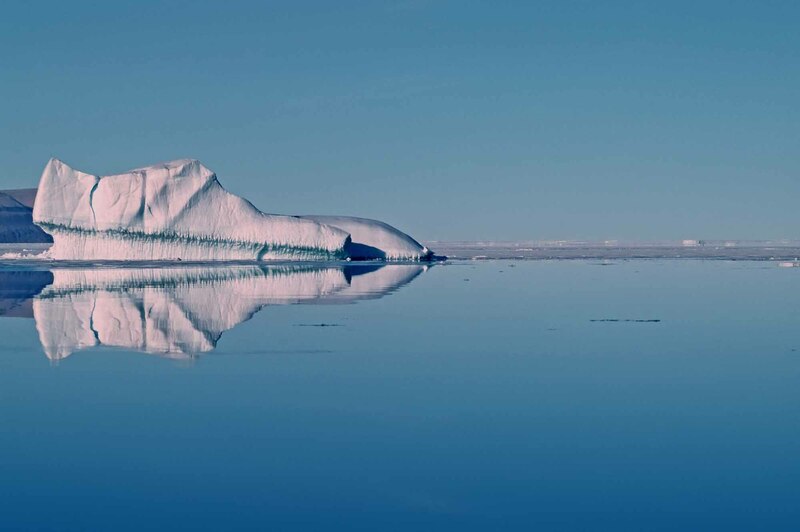 If it were to melt, world sea level would rise by about 60 m.
The Greenland Ice Sheet has an area of 1.7 million km2 and a maximum thickness of about 3.3 km, and would cause global sea levels to rise by about 6 metres if it all melted. 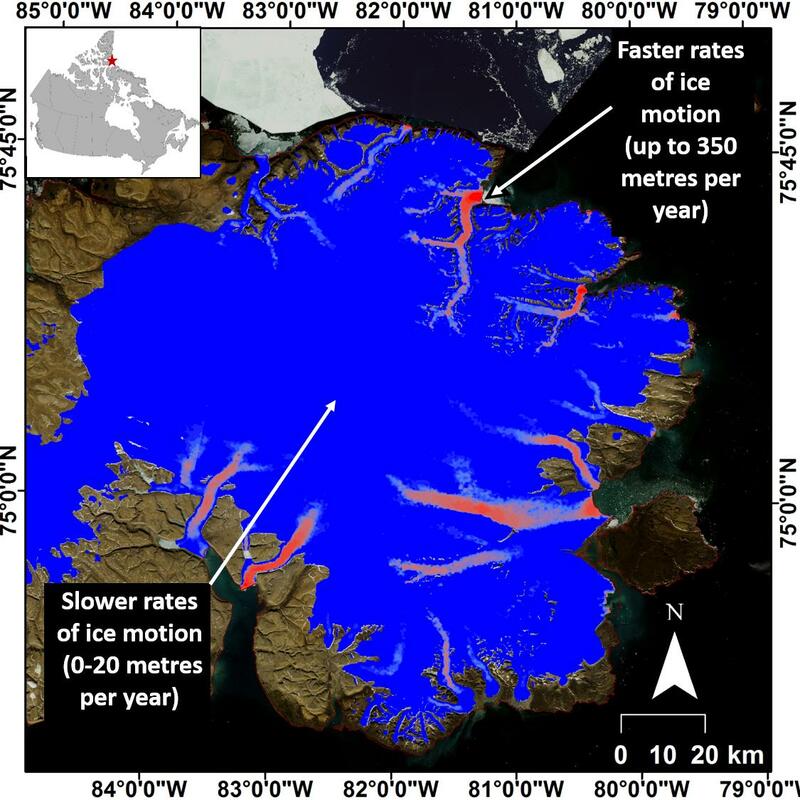 Outlet glaciers flowing from the Greenland Ice Sheet move at speeds of up to 10 km per year or more, and most have been rapidly retreating since the 1990s. Glaciers from western Greenland are the main source of icebergs seen in Canadian waters, with the ice caps and icefields of Devon and Ellesmere islands also providing important sources. These icebergs can be hazardous to shipping and offshore oil drilling in locations such as the Grand Banks off Newfoundland. Climate change has a profound effect on ice caps. In a stable climate, the surface of an ice cap does not change much from year to year because the ice that flows out of the accumulation zone approximately balances that which is lost from the ablation zone. However, if snowfall increases or summers become colder, the ice starts to thicken and, after some years, the ice front will advance. Conversely, less snow or a warmer summer will cause the surface of an ice cap to thin and eventually retreat. The speed of these advances and retreats depends on the ice mass: large ice caps can take hundreds of years to change, while small glaciers can take only a few years. However, in Canada, virtually all glaciers and ice caps have retreated dramatically over the past few decades due to the warming climate. Traditionally, the most common way to determine the health of an ice cap or glacier is to measure the change in height using stakes drilled into the ice surface. Yearly measurements of these stakes can then provide information on which parts of the ice cap are gaining or losing mass over time. Measurements of this type indicate that most ice caps in the Canadian Arctic remained the same size until the late 1980s. However, since then ice caps are increasingly losing more mass than they are gaining. For example, from 2005 to 2009, average mass loss in the Queen Elizabeth Islands was nearly five times greater than the 1963–2004 average. This pattern has been confirmed by recent airborne and satellite measurements, and primarily attributed to warmer summers. Ice cores drilled into the central part of ice caps and ice sheets can provide a continuous record of past snowfalls and climate. Annual layers can sometimes be distinguished and counted; if not, the ice can be dated by other means such as the identification of distinctive layers caused by volcanic eruptions. Ice cores from Greenland, Antarctica and Arctic Canada provide the most detailed record available of past air temperatures, extending in some cases to more than 150,000 years in Greenland and 800,000 years in Antarctica. Air bubbles in the ice contain samples of the atmosphere at the time the ice formed from snow, and so past concentrations of greenhouse gases, such as carbon dioxide and methane, can be measured. The concentration of carbon dioxide before the industrial era (circa 1750) was approximately 280 parts per million (ppm) compared with the present value of over 400 ppm, while the concentration of methane has more than doubled in the past 150 years. In addition to helping measure climate change, ice cores are valuable for pollution studies because the pre-industrial levels of trace elements such as lead and mercury can be compared to those today. Nuclear bomb tests in the 1960s, as well as the 1986 Chernobyl and 2011 Fukushima Daiichi nuclear accidents, produced radioactive layers detectable in snowfall and ice cores.